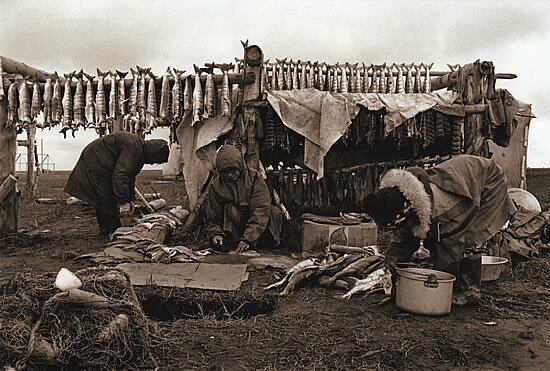 Cutting and drying salmon, Black River fish camp, 1980. Many Scammon Bay families continue to move to Black River to cut fish every summer. tussilluni pektetungraan. Anaggluta-gguq mer'em-ll' akuliinek, cikum acianek tegucugngaut neqnek. In those days because people focused on food, clothing wasn't something they sought, but food was more important. They told us never to belittle a man, even though he wasn't attractive, even if he had only one eye, even if he limped. They'd say that men could surpass us women and take foods from under the water or ice. 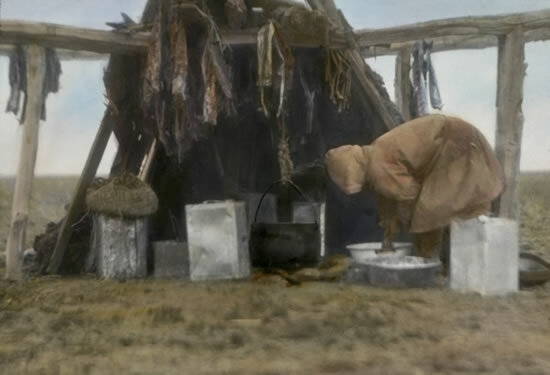 Communities varied widely in what foods were available to them, but everyone used similar processing and preservation methods, including air drying and smoking, storage in cold water and oil, fermentation, and freezing. Some foods were eaten raw. Salmon, herring, smelt, halibut, flounder, tomcod, pike, and capelin were gutted and air dried or smoked. Fish eggs were dried and stored. Storing preserved food was like "putting money in the bank." Preservation by dehydration is a race between bacterial growth and water removal. Dehydration removes the water that the microorganisms typically found on decomposing tissue need to live. The greater the surface area of a piece of fish, the faster the drying and the less time for decomposition to occur. A food can remain hydrated and not spoil as long as it is not exposed to bacteria. Spreading blood on the meat seals the surface to prevent spoilage (by protecting it from the air) until the fish begins to dry. If the water removal is achieved quickly, through rapid evaporation, the bacteria cannot survive and multiply, even though they are present, and they will die before they can spoil the food. The net floats on the front of this kayak are made of inflated seal stomachs. 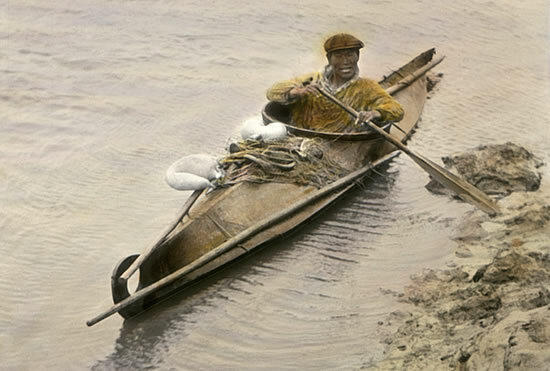 The kayak rides low in the water, indicating it carries a heavy load. Smoking is an age old technique for preserving meat, used by many people worldwide. It slow cooks the meat at a relatively low temperature (between 125º F and 250º F), allowing the tissue to dry without burning. Drying reduces the moisture that lets bacteria flourish. 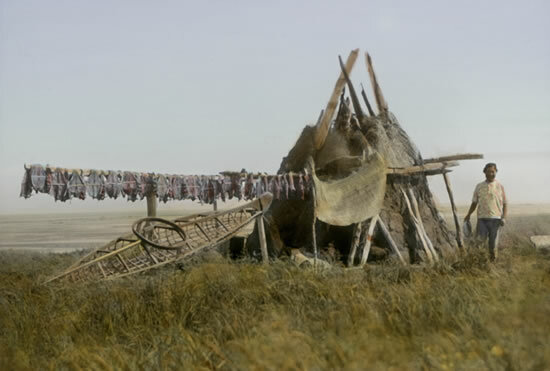 Frank Andrew said: "They made smokehouses using cottonwood driftwood for walls. But some who didn't have enough wood gathered their fish at the edge of the fish rack. Then they would cover the top with tall cottongrass or even old sealskins, and they would even place cloth around the outside wall and have those for smokehouses." A woman works outside her smokehouse, in the corner of her fish rack.